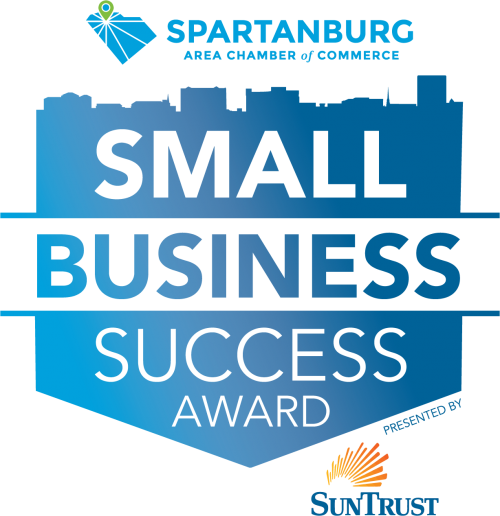 The Spartanburg Area Chamber of Commerce is proud to recognize the finalists for the annual James B. Thompson Small Business of the Year Award, presented by SunTrust. The finalists, recognized throughout the past year as Small Business Success Award winners, stood out for their exceptional business practices and community involvement. Now is the time to vote! Voting open until April 9. Awardees listed in chronological order from award presentation date. Membership based care with no health insurance required, Palmetto Proactive provides primary family medicine care with a focus on connecting the physician and the patient. Palmetto Proactive physicians spend an average of 25 minutes with every patient, proving a commitment to the highest-quality care for everyone who comes through their doors. Ciclops Cyderi & Brewery proudly works to "make absurd the norm" in Spartanburg. Ciclops has given beer and cider enthusiasts a welcoming, comfy place to enjoy traditional brews as well as off-the-wall styles created with everything from waffles to baseball bats. Ciclops never takes itself too seriously, but has provided Spartanburg a seriously cool place to enjoy the company of good people and good drinks. The Clevedale Inn & Gardens offers guests a trip to the colonial era. The homestead, refurbished to serve as a bed and breakfast and event space, is accented by stately pillars in the front and a spacious, elegant interior. The Clevedale Inn is a Small Business Success Award winner because of the space’s commitment to excellence and the one-of-a-kind environment it offers its guests. From its roaster along the Mary Black Rail Trail to its West Main Street location in Downtown Spartanburg to its soon-to-open spot in the Montgomery Building, Little River is the hub of Spartanburg's coffee culture. Doling out caffeinated cravings for more than 15 years, Little River has become a Downtown Spartanburg mainstay and its future as part of the revitalized Montgomery Building is bright. Cheers! Lauren Ashtyn has used her passion for style to help her clients look and feel like the best version of themselves. The Spartanburg salon specializes in luxurious hair extensions and other products inspired by Lauren’s passion and the culture of the modern salon. The Small Business Success Award is awarded to deserving small businesses and those that support them. Jason Huesman, with Heartland Payment Systems, has provided more than 100 small business owners with payment technology and software solutions, delivering innovative services to local customers, helping them ensure success. GOS has been providing office supplies to companies large and small across the Upstate for 50 years. GOS has aided hundreds of businesses in their office needs, connecting them with everything from office furniture to cleaning supplies to a professional printing service. The team at GOS works directly with customers on custom products to help them save money on office costs so they can dedicate resources where they’re needed. The Valet, LLC provides valet parking services for private and special events, restaurants, hospitals, sporting events, and weddings. The Valet is based in Spartanburg, but has expanded its reach to cover Greenville, Columbia and Charlotte. Need transportation? They’ve got that, too. The Valet has added shuttle and transportation services to meet all of its customers’ needs. With safety and timeliness as their top priority, drivers are sure to provide an unforgettable experience. Arrowhead Design Company offers branding & graphic design, web design, social media design, and in-house screen printing services. Located in Downtown Spartanburg and offering full in-house screen printing services, Arrowhead provides a unique and intimate experience that has allowed its business and clients to thrive. You can find team members at community events, such as Spring Fling, displaying their highly coveted “I’m a Spartanburger” apparel. The business must be physically located in Spartanburg County. The business must have less than fifty (50) full-time employees (FTE). Staying Power: Shows a history as an established business in Spartanburg County through time and community engagement. Company Growth: Shows positive growth trends in revenues and workforce. Innovation: Demonstrates creativity and imagination in business expansion and future planning. Involvement: Active as a civic partner, both as an organization and by encouraging employees to be engaged citizens. Response to Adversity: Facing challenges and overcoming obstacles with ingenuity, optimism and hard work. Nominees will be brought before the Small Business Council on the 4th Wednesday of each month. Each nominee will be evaluated based on the criteria above. Closing the discussion, council will approve, deny, or request further information. If further information is requested, program director or award chair will contact business owner directly.